Why shares of Fortuna Silver Mines dove so hard this week. Collective excitement electrified the room. When I joined senior executives and board members of Fortuna Silver Mines (NYSE: FSM) at the New York Stock Exchange a couple of months ago to celebrate the company's September 2011 listing on the Big Board, I knew I was speaking with a team that was at once thrilled by the growth prospects ahead of the company, and proud of what they had accomplished to date. While Fortuna's super-charged production growth profile remains fully intact, a meaningful bout of cost escalation became the primary trigger this week for a brutal share price drop. From a close of $6.14 on the eve of Fortuna's earnings release, the stock tumbled 30% to close at $4.28 Thursday as analysts revealed sharply reduced price targets and near-term earnings estimates. After this unforeseen turn of events, suddenly my No. 2 pick for silver in 2012 faces a tough climb just to reclaim its starting position. Let's take a closer look at what caused the carnage. Fortuna surprised the market with a fourth-quarter loss of $1.76 million as its mine operating margin contracted sharply to 43% of sales from 59% of sales in the prior-year period. At the company's Caylloma mine in Peru, "cost increases in qualified labor and industry-related services" pushed unit production costs 23% higher in 2011. Combined with lower base-metal by-product credits, Callyoma's cash-cost structure suffered a serious swing to $6.67 per ounce in the fourth quarter from the negative $6.31 cost reported for the prior-year period. Staring down the barrel at increasing smelter charges in Mexico, and Fortuna's own guidance for further cost inflation in 2012, analysts adjusted their earnings forecasts and price targets accordingly. CIBC chopped its price target down from C$9 to C$6.50, while lowering its estimate for 2012 earnings by 17% to $0.63 per share. BMO Capital Markets lowered its target price to roughly the same range, while upgrading the shares to "Outperform" in the wake of this week's sell-off. According to their revised outlook, analysts at BMO expect the eye-popping 2011 co-product cost of $16.12 per ounce to mark a long-term peak, with co-product cash costs expected to trend back toward $10 per ounce by 2015 as output from Fortuna's San Jose mine continues to ramp higher. For long-term investors, I believe that's the salient take-away here. This 30% haircut in Fortuna's shares has effectively removed any appreciable growth premium that had accrued in the stock given its impressive outlook for organic production expansion over the next several years. From 2011 production of about 2.8 million silver-equivalent ounces, Fortuna anticipates a monster expansion of 126% to reach 6.4 million silver-equivalent ounces by 2014 (excluding base metals). Although not quite as impressive as the prompt tripling of annual output anticipated by Aurcana (OTC: AUNFF) by 2013, Fortuna's growth profile is unquestionably a thing of beauty. Visiting Fortuna's nascent San Jose mine last December, I encountered a well-run operation that had achieved substantial underground development well ahead of its production schedule; all without sacrificing quality in the execution. Because I observed quality around every corner at the operation responsible for the company's looming multiyear growth trajectory, I remain upbeat about the company's outlook for long-term share-price appreciation. The stock's drop in recent days was largely warranted under the circumstances, but does create a compelling entry point just as the precious-metals mining sector appears stretched to the downside on valuations and thus broadly poised for a run to the upside. 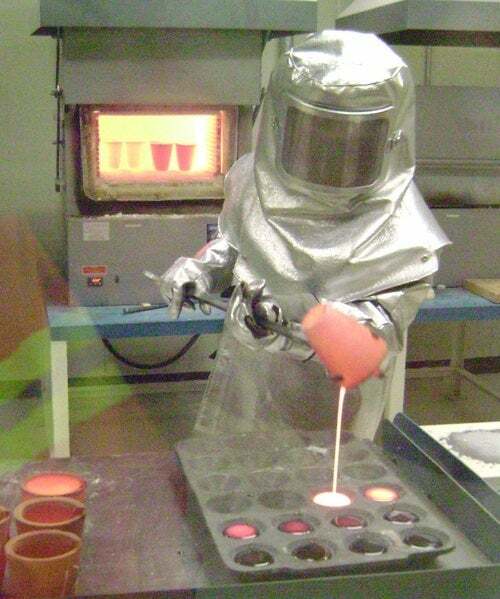 A worker at Fortuna's San Jose mine prepares samples for the mine's assay laboratory. Photograph by Christopher Barker. In particular, shares of Pan American Silver (Nasdaq: PAAS) trade at a massive discount to the miner's buried silver treasure, and downtrodden legend Hecla Mining (NYSE: HL) offers some serious blue-sky potential. For an instant basket of miners to spread execution risk among multiple operators, Fools may wish to take a fresh look at my selection of the best ETF for 2012: the Global X Silver Miners ETF (NYSE: SIL). Given the caveat that Fortuna's shares may take a little time regaining strength after the recent collapse, I believe that Fortuna's positive long-term outlook will beckon the attention of value investors looking beyond the near-term horizon. Although my bullish CAPScall from December 2011 is now deeply in the red, I have every intention of waiting patiently for what I view as the stock's inevitable return to strength. Join us today in the CAPS community to share your own silver selections. Looking for more ideas? Download The Motley Fool's special free report " The Tiny Gold Stock Digging Up Massive Profits ." Our analysts have uncovered a little-known gold miner that we believe is poised for greatness; find out which company it is and why we strongly believe in its future -- for free! Add Fortuna Silver Mines to My Watchlist. Add Pan American Silver to My Watchlist. Add Hecla Mining to My Watchlist. Add Aurcana to My Watchlist. Add Global X Silver Miners ETF to My Watchlist.